Other mistake: In a hockey game, Derek Thompson slams an opposing player into the wall and knocks out a tooth. Inexplicably, the tooth shoots straight up into the air and there is absolutely no blood on the tooth or around the player's mouth. Factual error: Hockey player Derek Thompson is nicknamed "Tooth Fairy" because he often knocks out the teeth of opposing players. His car license plate reads #1 TOOTH. In Michigan, where the movie takes place, the symbol # is not available for use on a license plate. Visible crew/equipment: When Rock is learning to fly, the top of the cyclorama wall is visible and the top of his flying rig harness is very visible with attempts to blur by post production on only some parts. Factual error: When Derek Thompson is seen with his full hockey gear on without a jersey, he is wearing the wrong type of chest protector. The type he is wearing is only used by goalies, not skaters. Deliberate mistake: All Minor Hockey Leagues in North America require players to wear visors with their helmets. Continuity mistake: When the Rock is giving the kid his present (a hockey stick) the paper covering it changes height in the shots. He even takes the paper almost all the way off when in the next shot it is back on. 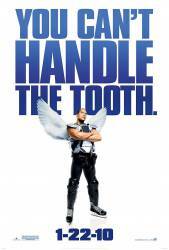 Derek Thompson: You can't handle the Tooth! And that's the Tooth, the whole Tooth and nothing but the Tooth! I pledge allegiance to the Tooth. When the goalie is scared away by Billy Crystal during the end credits, he yells the Wilhelm scream.